I've had an annoyingly disgusting cold since last Friday, March 18 and I was at home three days last week. UGH. I'm still not much better, but at least am functioning and up off the couch/bed. 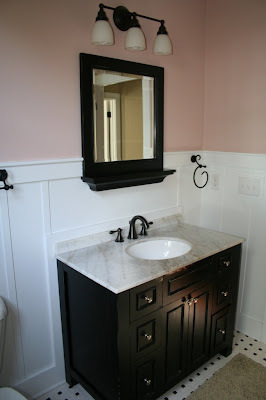 Over the weekend, I actually took some pictures of our hall bathroom. I've been slaving over this bad boy for a week! I completely repainted EVERYTHING in there. The walls, the wainscoting, and all the trim. 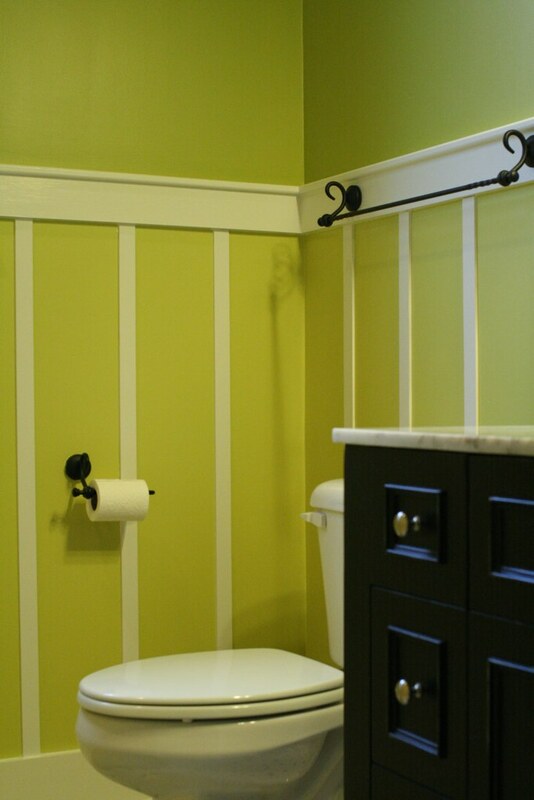 It's been a lot of work (and I still have one small area of wainscoting to tape and finish), but it's been worth it. 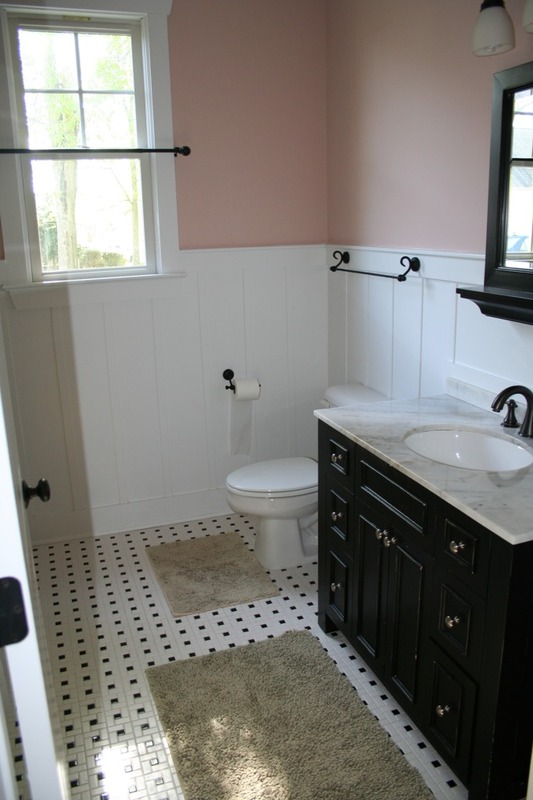 The bathroom feels so much cleaner just to have a slightly less white trim color that's shiny and clean. It makes it look brand new. As I mentioned in a previous post, I started painting this bathroom using 2 colors of paint that were left over from painting the guest bedroom in our previous house. 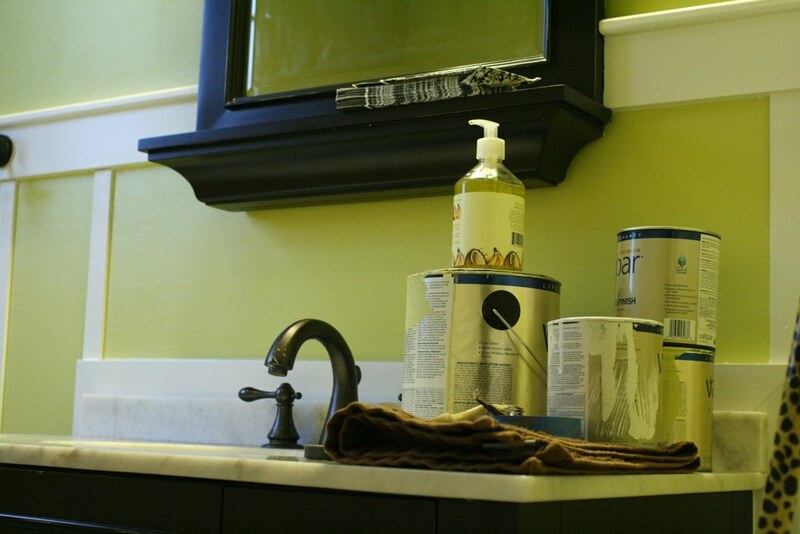 Both of these colors were flat paint and after I painted the first coats in the bathroom I realized I really need something with more sheen so I bought a quart each of 2 similar paint colors (they didn't have the colors I used previously) and finished the job. Before I reveal, let's just recap. 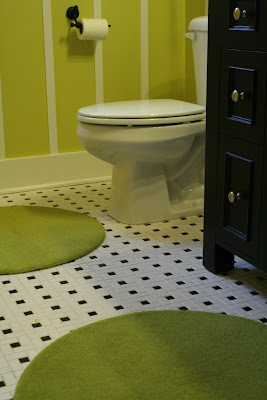 Here's what our bathroom looked like the day of the inspection. 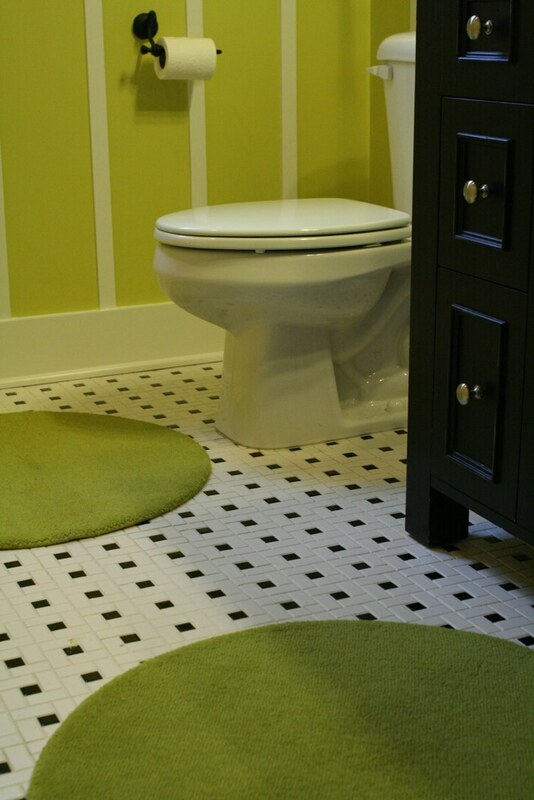 Cute, but not my personal taste in paint color. And now for the reveal! I messed with the white balance on my camera for a bit until I captured the room in as true-to-life colors as I could get. Hopefully, it reads well on this blog post. 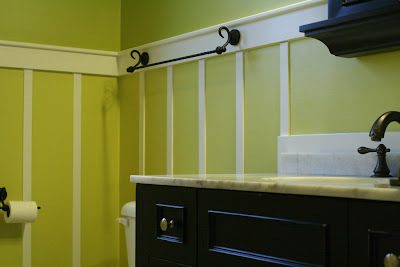 Wall color: New Avocado (Valspar, semi-gloss). 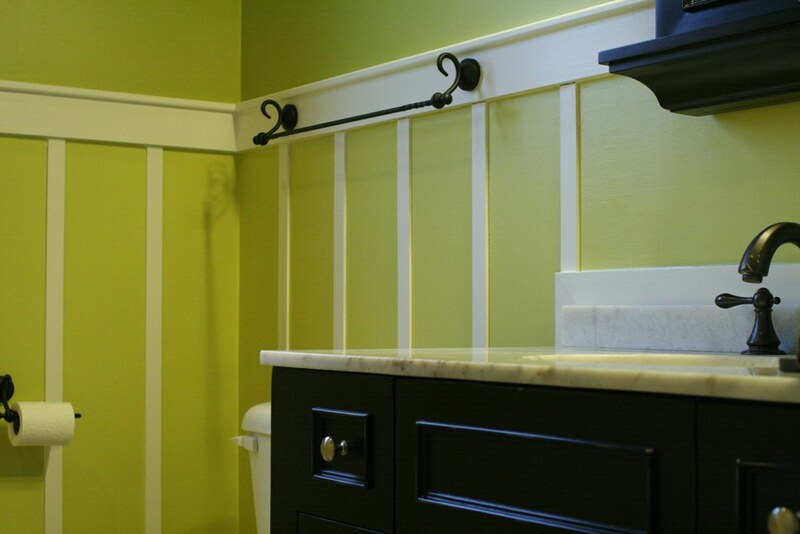 Wainscoting color: Crushed Cumin (Valspar, semi-gloss). 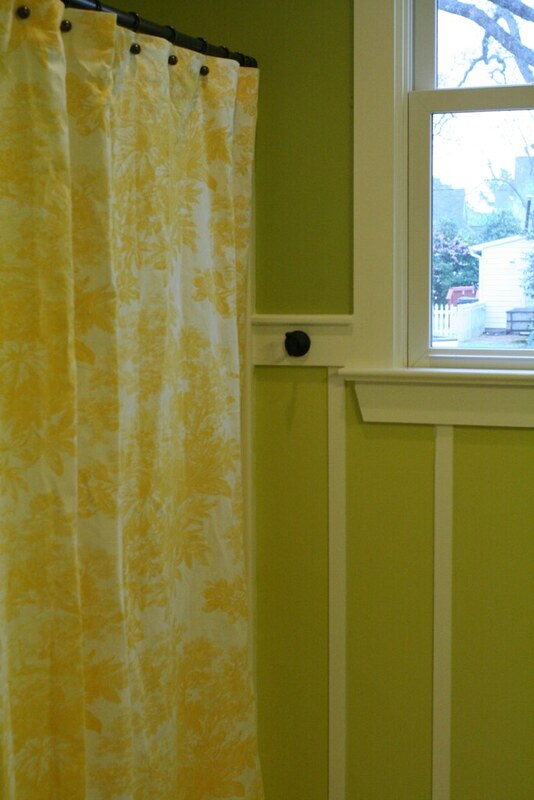 Trim color: Homestead Resort Jefferson White (Valspar, semi-gloss). I actually mixed the quart of New Avocado with what was left of the original flat paint color. It helped cut down on some of the shininess and it made the paint supply greater. I went with semi-gloss paint since this is a bathroom and I didn't want steam streaks on the walls. I still need to dress the room. I need curtains and towels and I want to relocate the towel bar and towel hooks and to hang pictures. 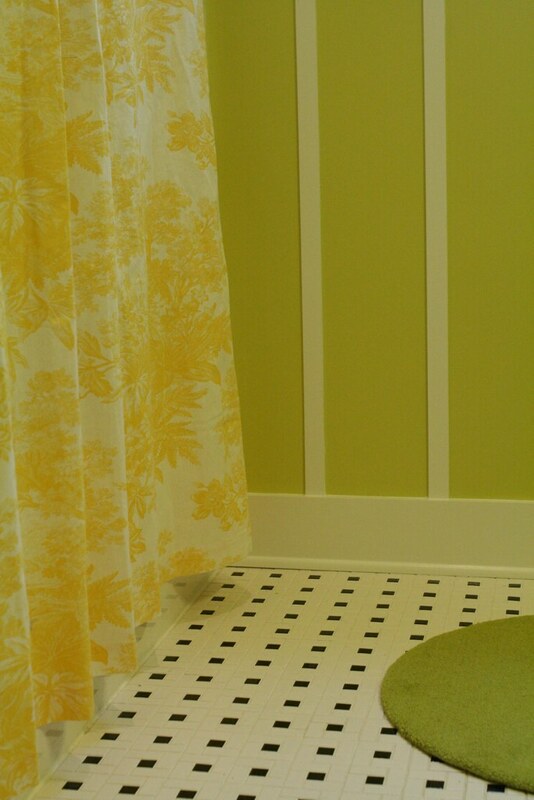 I also want to liven up the shower curtain. Monogram? Grosgrain ribbon border? Looks great! I love it! !